Enter your valid mobile number. One Time Password (OTP) will be sent to the provided mobile number. Once we verify your documents, a confirmation E-mail/SMS will be sent to you. The verification process may take few days. Your Aadhaar details received for linking your policy. *As you submit your Aadhaar Number issued by UIDAI, Govt. of India and voluntarily give your consent to link the Aadhaar Number to all your USGI Policies. You are agreed that USGI can use your Aadhaar Number, Name & your Aadhaar details to authenticate with UIDAI as per Aadhaar Act, 2016 and all other applicable laws. 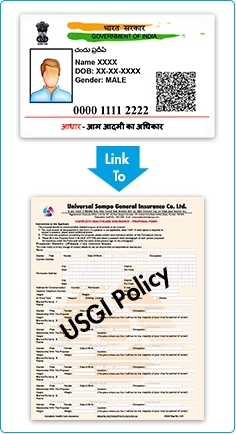 USGI is not responsible in case of any incorrect/unofficial information provided by you.